The United States Congress designated the Wolf Island Wilderness (map) in 1975 and it now has a total of 5,126 acres (5125.82 acres, technically). All of this wilderness is located in Georgia and is managed by the Fish and Wildlife Service. 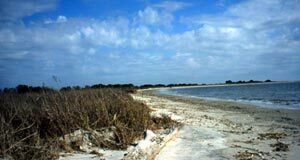 Established in 1930 as a sanctuary for migratory birds, Wolf Island National Wildlife Refuge includes Wolf Island, Egg Island, and Little Egg Island. All of the refuge has since been designated Wilderness. Large expanses of marshes, marshy hammocks, and tidal creeks separate the Wilderness from the mainland. More than 75 percent of the Wilderness itself is composed of saltwater marshes where birds hide, feed, and nest. Scaup, scoters, mergansers, and bufflehead are the most common wintering waterfowl species. The endangered piping plover winters on the islands, while the threatened loggerhead sea turtle is an occasional nester. A portion of Wolf Island is "upland," standing an average of 10 feet above the sea and including a narrow, four-mile strip of oceanfront beach. Sea oats, sandspurs, and other beach-dune perennials grow on the upland. The rest of the island is salt marsh dominated by cordgrass. Egg Island contains a little less upland than Wolf Island, including 1.5 miles of beach, and sports a dense growth of cedar, greenbrier, and blackberry. Salt marsh dominated by spartina altinaflora covers the remainder of the island. Little Egg Island, a low salt marsh dominated by spartina, goes completely underwater at high tide. Although the saltwater regions of the area are open to recreational activities consisting primarily of fishing, the marshes, beaches, and uplands are closed entirely to human visitation. Ten of the National Wilderness Preservation System's 803 wilderness areas are closed to access and use by the general public. Most of these closed areas are managed by the Fish and Wildlife Service. The core mission of the Service's National Wildlife Refuge System is conservation of native fish, wildlife, plants, and their habitats. The Wolf Island Wilderness, part of the Wolf Island National Wildlife Refuge, is closed to visitation to protect wildlife and other natural, cultural, and/or other resources consistent with the conservation purpose(s) of the refuge. Wilderness designation provides an additional level of protection for the wilderness portion of this refuge, but does not open the area to public access or use.